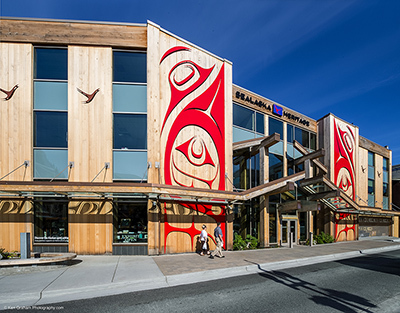 A new study by a Juneau research firm has found that Sealaska Heritage Institute’s (SHI) economic impact on Alaska was more than $10 million in 2018 and that its impact on the City and Borough of Juneau (CBJ) was $9.2 million. 200 Juneau businesses and individuals benefited from SHI purchases and contracts. $800,000 was paid to 60 Juneau-based contractors for an average of $13,500 each. Contractor payments were primarily in support of SHI grant programs. $750,000 was provided to the Juneau School District and the University of Alaska Southeast for additional teachers and staff, teacher education, and arts programs. $120,000 in Sealaska scholarships was awarded to 59 Juneau students, of which $70,000 was spent on education at UAS. Caption: Sealaska Heritage Institute. Photo by Ken Graham. For a higher resolution images, contact kathy.dye@sealaska.com.